Every end is a new beginning, including the transition from 2016 to 2017. This year has been tumultuous to say the least and most of us are fatigued with politics and the never ending negative news cycle around the globe. I would like to encourage you that although the world may seem bleak at times, many amazing things are happening. People are living longer, world hunger is dropping and economic development and aid is improving communities around the world. This year has been an important year for Khusi Hona. 2015 was filled mostly with our disaster relief operations in Nepal all while continuing our regular operations and support in India. 2016 brought us the beginning of the Khusi Hona Lotus Center in South India, a powerful women empowerment program that we are now planning to expand into rural communities in central India. We have continued our commitment of support to the communities affected by the earthquake in Nepal. Our focus has largely been small economic development projects such as our innovative e-rickshaw business to support an orphanage and the beginnings of a rural fish farm designed to fund a school. We have also continued to provide service learning trips to youth from the U.S. Our annual trip organized a large group of high school and college students to India for 2 weeks. Our work focuses on education, art, environmental, athletic and technology projects that forge deep and lasting relationships while inspiring dedication to community service near and far. We are excited to announce several new developments. Many of the remote areas of India have little or no access to medical facilities or to the basic, yet critical, information about what it takes to maintain adequate health and cleanliness. We have received a grant to begin to implement a nutrition & health care awareness program that will provide life saving health care and access to surgeries to some of the most unreached parts of India. 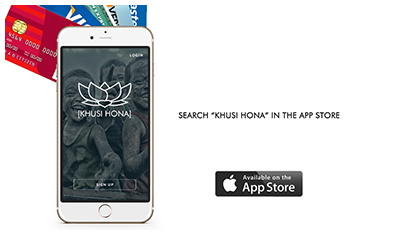 We are also excited to announce the release of the new Khusi Hona app available for download today in the app store (Android coming soon!) Here is how it works: The Khusi Hona app allows you to automatically donate spare change from your everyday purchases directly to Khusi Hona. It’s easy, each time you make a purchase with your linked card, the resulting change is automatically donated. You have all the control and can even set up to how much a month you are comfortable donating. Every purchase you make sends a little hope to those who need it the most. Connect your card, make some purchases, donate your change – it’s that easy! Make big things happen, pledge change – a little each day! 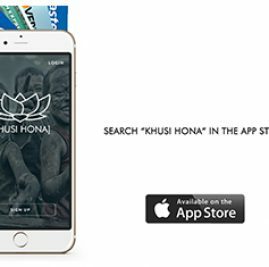 Go to the app store, search “Khusi Hona” and download. Don’t have an iPhone, no worries – click here for all the same powerful tools to make supporting Khusi Hona so easy! Since our inception Khusi Hona has regularly posted “Action Items” an opportunity for you to learn about and directly fund a small and attainable project. We introduce you to the issue, present the solution and 100% of your donations go towards the project. This year has seen so many wonderful accomplishments directly tied to action items and the majority of our donations are received through this platform. As the year comes to a close we are asking for your monthly support so that we can continue our mission to empower vulnerable people with solutions that allow them rise above their poverty. There are two very easy ways to do this. First is go to the Khusi Hona website and click on the donate button and pledge a monthly gift of $10. The second is to sign up to our new app and pledge your change. As always your donation is tax deductible. If you’re a social media user, please take a moment to follow us on Facebook, Instagram and Twitter, and be sure to use the hashtag #feelhappy. The Lotus Center is open! Change is inevitable. Growth is optional. A letter from the founder. Khusi Hona’s mission is to empower vulnerable people with solutions to rise above their poverty. We are guided by a principle of social entrepreneurship and believe that breaking the cycle of poverty starts with tangible, life-changing opportunities. Khusi Hona © All Rights Reserved.